It's been a long three months but Quinnipiac is back in the commitment game. 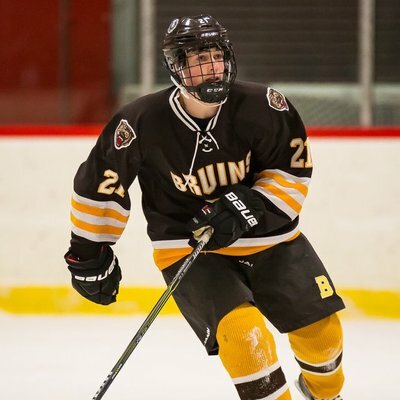 On the eve of the NCAA tournament selection show, the Bobcats picked up a 2003 born commitment in forward Matthew McGroarty, a native of Westport, Connecticut who is currently a sophomore playing for the Brunswick School in Connecticut. McGroarty is a 5'10, 150 pound right shot forward who in 28 games played for the Brunswick School had 14 points on 6 goals and 8 assists. He also was a member of the Mid FairField Jr. Rangers U-16 team but his statistics with them are unknown at this time. 3.75 Matthew McGroarty to Quinnipiac. No frills, power forward w/a game on the rise. He is powerful, direct & goes to the net with his stick on the ice. Hard on the forecheck & is tough to play against. High grades at Select 15s, WSI and U14 Nationals. Another respected hockey scout told me that McGroarty is second line center with great skating ability and good hockey IQ who works his tail off. The scout added that he is a great get for Quinnipiac as he had some Hockey East teams on him. Currently I have McGroarty pegged to arrive in Hamden for the 2022-2023 which would take him through his junior and senior seasons at Brunswick along with one season of junior hockey prior to arrival.